Image Size: 15 X 11 in. "Horses are such social animals and seem to emulate human behavior. 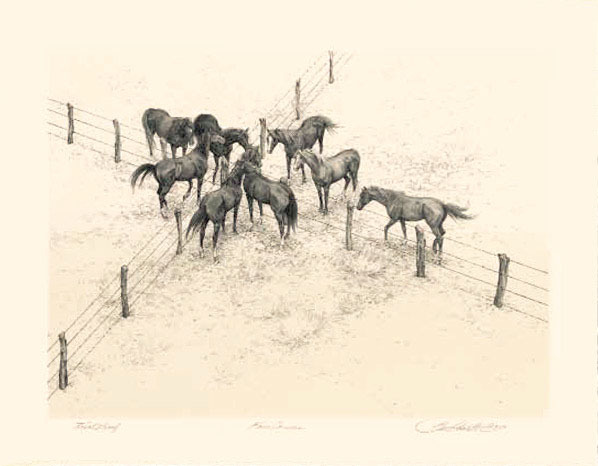 Whatever their pecking order or whatever they may be communicating to each other, I always wonder what is going on," says Bev Doolittle, who captures a moment at a crossroads where horses have called an impromptu meeting. "Regardless of the space they have to roam, horses have nonetheless come from all corners of their world to gather like neighbors meeting over the backyard fence or a coffee klatch on a Sunday morning."